Dubai is a dazzling city of two halves – One side so rich and modern it's like a version of the future, the other like stepping back in time. Of course, you can't take a trip to Dubai without visiting the desert for a camel ride but did you ever consider sand-boarding and dune basing? Adventure seekers will be thrilled with what Dubai has to offer but traditional culture vultures won't be disappointed either! Whether you get yourself on a small-group tour with local guide or a hop-on-hop-off bus tour so that you can plan your own itinerary you'll be able to visit the souk's, ride down Dubai Creek on a traditional wooden boat, and marvel at the view from the iconic Burj Khalifa as you watch the Dubai Fountain put on its famous show. We know how much time goes into researching and planning a trip which is why we've done the hard work for you. Here you can find the top 10 things to see and do when in Dubai and it's not based on what tour operators want you to see and do, we've read the reviews from people just like you to see if a tour is worth taking. We've also compared different ticket options, checked prices, and listed all the need to know information that makes for an unforgettable time. You can thank us later, for now, see what trips and tours in Dubai take your fancy! 360-degree panoramas from the 124th and 125th floor. 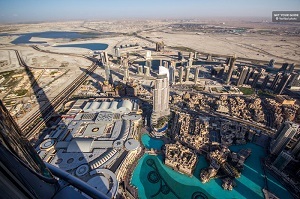 Look down on Dubai from the viewing platforms at level 124 and 125. Enjoy 360-degree views over the Arabian Gulf. Witness the Dubai Fountain show from above if you're up there when a show takes place. Timed entry to the 124th and 125th floors. Wi-Fi access and use of the telescopes. 10% discount at the cafe and 10% discount in the gift shop. ” We had a really excellent time and the Burj Khalifa is an amazing building. Highly recommend booking this activity"
"Amazing to see all of Dubai from such a height!!!! The most amazing thing about this event was the elevator. We ascended 124 floors in about 30 seconds and didn't feel a thing!" ". It was fun watching the dancing fountain display from the 124th floor in the dark, and the panoramic views of the city were more impressive and interesting than I was expecting. I recommend doing this at night as Dubai really knows how to light up their city." A must-do experience when in Dubai. Great for people who like breaking Guinness World Records! Not suitable for people who are scared of heights or who suffer from claustrophobia. Visit a camp in the Lehbab desert for the time of your life! An afternoon trip to the desert lasting 6-7 hours with dinner included. Multiple cultural activities and adventure sports to be enjoyed. Red dune bashing in 4X4's. Sand boarding and a camel ride. BBQ dinner with belly dancing, falcon flying, henna tattoo's and more. 30-40 minutes driving over the dunes 'dune bashing' in 4x4's, a camel ride, sand boarding and many other activities. A BBQ dinner (vegetarian options available) with unlimited soft drinks. Pick up and drop off from your hotel with an English-speaking driver/guide. 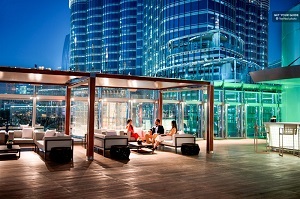 ”A great experience, total value for money"
"Simply the best thing to do in Dubai." "A quality trip not to be missed." An action packed afternoon and evening perfect for those seeking adventure, thrills, and culture. A tour that will stay with you a lifetime, great for couples, friends, and families who want to make memories. The sand duning part of the trip is not suitable f or kids under 4 or pregnant women. A sightseeing day trip to Abu Dhabi. Group trip by air-conditioned coach with multilingual driver/guide. Insight into the culture, heritage, and history of the Capital of the UAE. Visit a traditional Heritage Village. Drive past Corniche, the Presidential Palace and more. Entry to Sheikh Zayed Mosque. Hotel pickup/drop-off and transport by air-conditioned minibus/coach. Driver/guide who speaks English, German, Russian, French, or Italian. ”Very good organization for the tour to Abu Dhabi, with nice tour and nice stops during the tour." "Interesting tour to Abu Dhabi, Mohamed gave us a lot of good information about all the things we could see and a lot of information about all the U.A.E." "The day was amazing from the start to the end and that’s all thanks to our amazing Tour Guide Mohammed. " A great way to see the Grand Mosque as well as other landmarks and places if you don't fancy going to Abu Dhabi alone. Good for people who enjoy organized tours and allowing the guides to make the decisions on where to go and what to see. Not suitable for people who want to explore on their own or those who dislike long bus journeys. 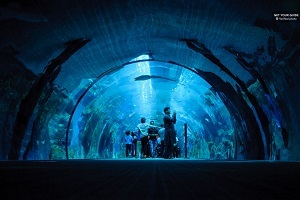 One of the largest indoor Aquariums in the world. More than 33,000 aquatic animals with over 140 species. An incredible walk-through glass tunnel. Visit the Aquarium Tunnel & Underwater Zoo. Guided tour of the Study the Sea Jelly Lab. Opportunity to feed the sharks and stingrays. ”Amazing! So close to the sharks and other fish, a must see if you can!" "A fantastic experience, highly recommended!" " Absolutely fantastic and thoroughly enjoyable." A great place to spend time with the family. The unique 'behinds the scenes' aspect is great for those who want to learn more about the breeding habits and environmental changes of the sea life. If you've visited lots of other aquariums around the world, you may feel that this one doesn't offer much more value. A 3 course meal at Burj Khalifa. A romantic evening whilst looking down on the lights of Dubai. 360-degree views from the Level 124 observation platform. Take in the 360-degree views from Level 124. Enjoy romantic fine dining with a 3-course meal. Watch the Dubai Fountain show. Access to level 124 observation platform. Free Wi-Fi access throughout the experience. ”This was fabulous value for money with the 3 course meal included." "View was great, great food and great location!" "Superb value for money, I highly recommend booking this before you arrive in Dubai, it was certainly an evening to look forward to, we were not disappointed!" A special and romantic evening for couples. A memorable experience if you haven't been up Burj Khalifa before. Also good for groups of friends whether celebrating a birthday or just their vacation in Dubai. A boat ride during the Dubai Fountain show. A unique viewpoint from on the water. A light and music show to remember. Watch the Dubai Fountain show from onboard a traditional Abra boat. Enjoy the breathtaking show from on the water. 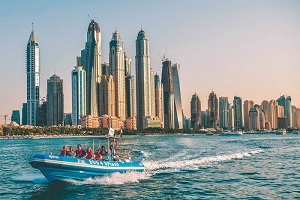 Cruise past some of Dubai's top attractions. Cruise past some of the top attractions. ”The boat ride is a must if you want to watch the fountain show in style." "The ride was great, felt like being in Venice but with skyscrapers. The show was great, nice view. Would recommend, very romantic." "It was definitely worth the price and we had lovely people in our group - Our host Siddique made sure our experience was very good." A memorable experience for couples and families who want to see the fountain show up close without the crowds. Great for people who have extra cash to spend and who want to enjoy the fountain from a different angle. A romantic cruise for couples but also suitable for families. A 90 minute speedboat ride along Dubai's coast. Live guide and lots of photo opportunities. Admire the view from Dubai Marina. See the man-made island group The Palm Jumeirah. See 2 of Dubai's iconic hotels from the water. ”A good way to see the sights." If you like sightseeing plus action-packed adventure this is a tour made for you. Suitable for the whole family, including young kids. 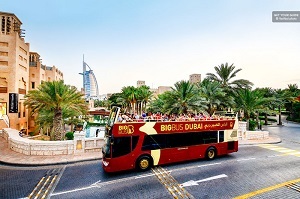 A hop-on-hop-off sightseeing bus tour with 3 day routes and 1 night route. Explore the old and new parts of the city at your own pace. Plus access to a free Dhow Cruise and 10 museums. See the top sights from an open-top bus. Learn about the sights you're passing either with live commentary (red route and night route) or audio commentary. Hop off whenever you want to explore the city making use of your free boat ride and free museum tickets. 24 hour hop-on-hop-off bus tour covering 3 daytime routes and 1 night time route. Free entry to 10 museums and free walking tours. ”Fantastic way to see all the sights!" "It was a great way to tour the city and learn some of its history"
"Best value tour to see the city in one go"
A great way to explore the city and move from A-B without having to navigate the metro or local buses. Good for those who want a quick overview as well as those who want to see and do everything because you can hop-on-and-off as much or as little as you want. A sightseeing tour covering the old and new parts of Dubai. A walking tour and coach/minibus tour with multilingual guide. Cross Dubai Creek by 'Abra' (water taxi). Visit the gold and spice souqs. Visit Bastakiya the historic quarter and see the modern skyscrapers. 4-5 hour sightseeing tour with multilingual guide. Admission fees to the mosque and the water-taxi. Hotel collections and drop off. ”The guide was knowledgeable and it was possible to visit places one could not do alone. Well worth the money." " Guda was a great guide, interesting for people who do not have many days to spend in Dubai and need a short and concise overview"
" Well organised, very informative, our Guide Abdul also told us a lot about life in Dubai. " A good way to discover Dubai and learn about its history. Great if you like organised tours and being able to ask your guide questions. Not fully accessible for wheelchair users – The water taxi and parts of the museum are not wheelchair friendly. A ride on the world's largest Dhow. An evening dinner cruise along the Dubai Creek. Evening entertainment and 5 star all-you-can-eat buffet dinner. 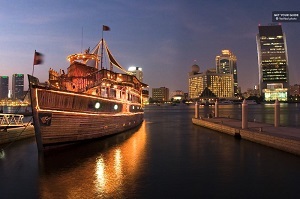 Take in the sights as you cruise down the Dubai Creek onboard the world's largest Dhow. Tuck into a buffet dinner featuring international cuisine. Enjoy evening entertainment with traditional dances. 2 hour cruise down the Dubai Creek. Evening entertainment with dancing and henna painting. ” A very memorable experience for my husband and myself! We sailed through Dubai's history, had a great meal at the buffet and had fun with their show!" "This was a fantastic cruise. Food was outstanding, and the entertainment was out of this world." "I loved this tour, the food was great, attention of the staff was incredible and the boat was very good!" A great way to celebrate being in Dubai whether you're a couple of a group of friends. Great for those who want to see some traditional entertainment and who don't mind audience participation I.e. getting up and dancing the traditional dances. The buffet is international so this is not suitable for people wanting to try traditional recipes from the UAE. 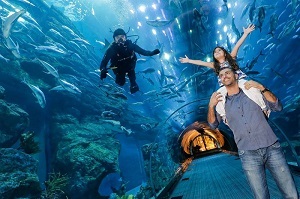 A combo ticket allowing its holders to visit the Dubai Aquarium and the Burj Khalifa, two of the top attractions of the city, for a privileged price. Burj Khalifa is the tallest building in the world, surpassing the next tallest structure for almost 200 meters. Dubai Aquarium is home to hundreds of aquatic species, including rare ones such as Sand Tiger Shark and King Crocodile. Visit two incredible attractions of Dubai in one day. Enjoy panoramic views of the city, Persian Gulf and the surrounding desert from the highest observation platform in the world. Visit the Dubai Aquarium and acquaint yourself with the spectacular diversity of marine life. Timed entry to Burj Khalifa and its observation deck. Admission to the Dubai Aquarium. "the view is superb and even better from the 125th floor"
"We were amazed at the type of underwater animals on display"
"Stunning great day worth every penny"
The combo ticket is ideal for travelers interested in discovering two top attractions of Dubai. Fans of nature and marine world are highly recommended to book the ticket. Make sure you aren't height sensitive before visiting the Burj Khalifa's observation platforms. 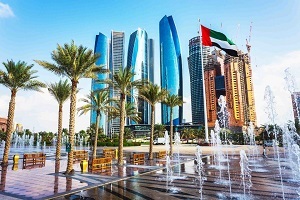 A day trip to Abu Dhabi, the largest emirate of the United Arab Emirates. The trip encompasses top attractions of Abu Dhabi, such as the Sheikh Zayed Grand Mosque, Emirates Palace and the Heritage Village. The guided tour introduces the history of the UAE. 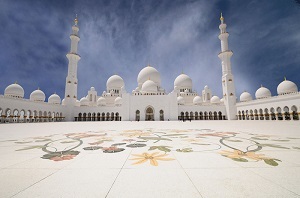 Travel to Abu Dhabi, the capital of the namesake emirate, and learn the history of the United Arab Emirates. See splendid governmental, religious and other structures, including the Etihad Towers and the Sheikh Zayed Grand Mosque. Admire views of the futuristic design of the Ferrari World as you visit Yas Island. A round trip in a comfortable, air-conditioned vehicle. Pickup and drop-off at centrally-located hotels in Dubai. "Good way to spend your day and visit an amazing city with a unique mosque." "Very well organized, and great people working for them." The tour is especially convenient for people interested in grand architecture. The tour caters to history buffs curious about the unusual past and present of the UAE. The Aquaventure ticket entitles visitors to have fun at one of the top entertaining facilities in the Middle East. Aquaventure disposes of various slides, falls and tunnels for those wishing to feel surge of adrenaline. For complete relaxation, visitors make use of a private beach. Enjoy entertaining rides and have fun while touring the attractions of the Aquaventure. Have a safe slide in the area occupied by real sharks. Relax at the private beach and feel a surge of adrenaline as you ride down almost vertical Poseidon's Revenge. Admission ticket to the Aquaventure entertainment complex and the adjacent private beach. "Do not forget to try Aquaconda and Zoomerango!" "It was a lovely day!" "Spent all day here, was absolutely amazing and well worth the money." Aquaventure park caters to people of all ages and interests. The attraction is suitable for the adventurers and people willing to relax alike. 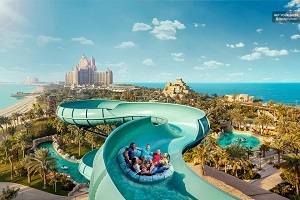 Aquaventure is a top attraction of Dubai and, hence, a must-visit place. A several-course dinner in a bedouin-style camp in a desert at the outskirts of the city. 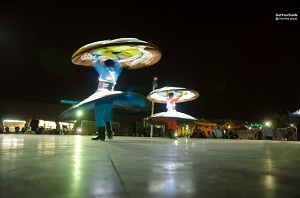 Entertaining performances, such as belly dance and tanoura shows, are part of the experience. A camel ride or a henna tattoo are some welcoming extras. Enjoy a several-course BBQ dinner in a bedouin tent in the desert near Dubai. Admire the matchless skills of tanoura performers and belly dancers. Opt to ride a camel or have a henna tattoo drawn on your hand. "Great night out well worth the price when compared to eating out in Dubai." 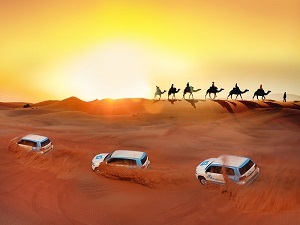 "definitely it is a must to do it in Dubai"
This activity is an ideal opportunity for travelers who don't like the daytime's heat to spend some time in the desert. Highly recommended for tourists interested in the authentic Arabic performances and art. An opportunity to enjoy skiing and snowboarding in the desert city. Visitors may choose a run that corresponds to their skills in skiing or snowboard in a Freestyle zone. All necessary equipment is available at Ski Dubai. 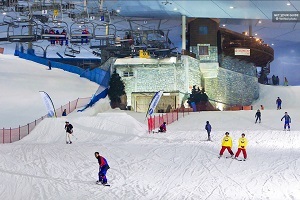 Ski or snowboard for two hours at the Dubai Ski complex. Choose among five ski runs ranging from novice to expert levels of difficulty. Have fun while you snowboard or relax at an on-site cafe. The equipment consisting of helms, boots, skis and other necessary gear. A 2-hour Ski Dubai Pass. "This was my first time skiing and I loved it." Visiting Ski Dubai is the right thing to do for every fan of winter sports. Especially recommended to fans of skiing and snowboarding. Whether you are an expert or a rookie, you are sure to have fun at Ski Dubai. Miracle Garden is an attraction out of a fairy-tale where visitors admire various objects and patterns entirely made of flowers. 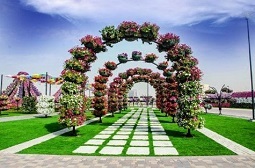 Dubai's Miracle Garden displays tens of millions of flowers and boasts the longest wall of flowers in the world. Dubai Global Village is one of the shopping hotspots of the city. 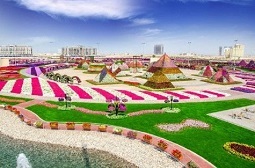 Admire imaginative objects and structures, such as cars, houses and the UAE landmarks, entirely made of flowers in the Miracle Garden. Marvel at elaborate floral shapes and patterns and visit the 3D butterfly garden to see butterflies in various colors, sizes and shapes. Shop until you drop in the Global Village of Dubai. "The real flying butterflies so gorgeous flying in peace." "The Miracle Garden and Global Village were amazing. "We definitely come back one day"
If you are a fan of nature, visiting the Miracle Garden is a high priority for you when you are in Dubai. The combo ticket also caters to passionate shopaholics and cosmopolitan travelers. The admission ticket to one of the newest extraordinary attractions in Dubai, the UAE. Miracle Garden is a botanical complex exhibiting millions of flowers in surprisingly imaginative ways. In the garden, visitors have an opportunity to see many patterns and objects made of flowers. Take a walk among manicured gardens and examine many intricate objects made of flowers. See countless colorful flowers belonging to exotic and rare species. Visit the world's longest wall made of flowers. 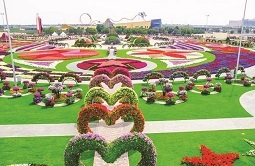 "Beautifully maintained and breathtaking sculptures"
"If you want to see a glimpse of wonderland just visit Dubai Miracle Garden"
"A true Disney World for flowers!" The attraction is suitable for visitors of all ages and fitness levels. Visiting the Miracle Garden is especially recommended for devotees of art and botany. Complimentary transfers accompany the ticket, making it convenient for visitors of Dubai with limited time. This entertaining activity is an introductory tour of flora and fauna of Dubai. Miracle Garden of Dubai exhibits tens of millions of flower species and boasts the world's longest wall of flowers. Butterfly Garden consists of 9 domes, and each of them is inhabited by many colorful butterflies. Visit the Butterfly Garden, abounding with colorful butterflies, and tour the Butterfly Museum. Admire intricate patterns of the Miracle Garden made of countless, colorful flowers. Enjoy the benefits of the pickup and drop-off service. "The driver was always on time, very nice and friendly." "Two beautiful places to visit." "Both gardens were very beautiful and we enjoyed looking around and taking pictures"
Miracle and Butterfly gardens are attractions suitable for visitors of all ages. The combo ticket is especially attractive for fans of nature and passionate photographers. Thanks to the round-trip transport, the package caters to travelers that are new in Dubai and everyone valuing their time.